The Club would like to congratulate Shainah Joseph (Mavs'13) on her most recent award the Evelyn Holick award presented by the OVA. In a year of many firsts for the Club Shainah becomes the first female Maverick athlete to win this prestigious award. 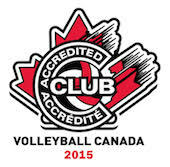 Shainah will receive her award the weekend of the 18U Provincial Championships.